This is the transcript of the GOP debate at the Reagan Library Wednesday January 30. 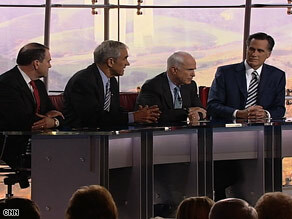 The candidates debate Wednesday at The Reagan Library in California. (CNN) -- ANDERSON COOPER, CNN: The first question is actually a question that will go to all of you, but I'll start with Governor Romney. During a 1980 debate, he suggested Americans determine who to vote for by asking themselves, "Are you better off than you were four years ago?" So tonight, in terms of the economy, are Americans better off than they were eight years ago? FORMER GOV. MITT ROMNEY: Well, if you're voting for George Bush, you'd be very interested in knowing the answer to that. If you're voting for Mitt Romney, you'd like to know, "Are you better off in Massachusetts after four years of my term in office?" And the answer would be decidedly yes. I came into a state which was very much in a deep ditch. It was losing money every month. We had a $3 billion budget gap. We had people losing jobs every single month. During my predecessor's term, we'd lost 160,000 jobs. We kept losing jobs for a couple of years. We got it turned around, began adding jobs back. We won some huge contracts to bring in some new employers into the state. Some of them haven't even built their facilities yet. We solved our budget problem, $3 billion budget gap, without raising taxes. We were able to do that in a way that I think surprised folks. COOPER: Let me just interrupt. The question was: Are Americans better off than they were eight years ago? And as you know, there are a lot of Americans out right now who are very interested in the answer. They're not feeling particularly good about their home sales -- the value of their homes dropping down or the unemployment rate rising. How do you feel America is doing? ROMNEY: But I'm not running on President Bush's record. President Bush can talk about his record. Washington is badly broken. I think we recognize that. Washington has not dealt with the problems that we have in this nation. It hasn't reduced our burdens on our middle class, hasn't solved the Social Security problems, hasn't dealt with the health care crisis that we have in this country, hasn't improved our schools as much as we'd like to get them improved. Nevertheless, this president did pull us out of a deep recession. He put in place two tax cuts which did get the country out of a recession and helped rebuild the country. Now we see ourselves headed apparently towards one again. We hope not. ROMNEY: Whether there's a recession technically or not, one thing we know -- middle-income families are feeling squeezed and people are losing homes and people are having a hard time paying for their gasoline and they're having a hard time paying for heating oil in places that that's a big part of their life. And as a result, we've got people that feel there needs to be a change in Washington and that's something I represent. FORMER SEN. JOHN MCCAIN: I think you could argue that Americans overall are better off, because we have had a pretty good prosperous time, with low unemployment and low inflation and a lot of good things have happened. A lot of jobs have been created. We need to make the Bush tax cuts permanent, which I voted for twice to do so. I think we need to eliminate the alternate minimum tax that sits out there and challenges 25 million American families. COOPER: It sounds like that we're not better off is what you're saying. COOPER: It sounds like you're saying we're not better off. MCCAIN: I think we are better off overall if you look at the entire eight-year period, when you look at the millions of jobs that have been created, the improvement in the economy, et cetera. What I'm trying to emphasize, Anderson, that we are in a very serious challenge right now, with a lot of Americans very uncertain about their future, and we've got to give them some comfort. We've got to give them some stimulus. We've got to give them some tax relief. We've got to stop this outrageous squandering spending that causes us to have to borrow money from China, and we've got to get our fiscal house in order. I think we went on a spending spree that, frankly, betrayed Ronald Reagan's principles about tax cuts and restraint of spending. COOPER: Let me just give the question now to Senator -- I'm going to ask everyone. So, Governor Huckabee, if you can, briefly: Are we better off than we were eight years ago? FORMER ARKANSAS GOV. HUCKABEE: I don't think we are. And the real issue, though, let's not blame President Bush for all of this. We've got a Congress who sat around on their hands and done nothing but spend a lot of money and they're spending, leaving us $9 trillion in debt that we're passing on to our grandchildren. I don't blame the president solely for that. So I think if we're asking is George Bush responsible for all this, no. But are we better off? Well, let's look at some factors. Right now, home sales are -- new home starts, anyway, are down 40 percent. That's going to have a cascading impact on everybody who sells lumber, who is in the building trades. If you talk to people who are driving trucks across America today, their fuel prices are significantly higher than they were a year ago. They're hurting because they're not making a lot more money to haul something, but they're spending a lot more money to get it done. And all over our economy, with unemployment up to five percent across the nation, that means there are a lot of families today that don't have a paycheck and if you don't have a paycheck, then it's hard to put groceries on the table and it's hard to pay the rent. And I think what Americans are looking for is somebody to just honest with them and straight with them and tell them that, no, it's not better and it's not going to get better unless we have some serious leadership in Washington that says that we're going to have to start having policies that touch the people not just at the top, but the people at the bottom. And they feel like they're invisible to a lot of people in government today. COOPER: Congressman Paul, 61 percent of Americans think there is a recession already -- 61 percent of Americans say there's already a recession. TEXAS REP. RON PAUL: No, no, we're not better off. We're worse off, but it's partially this administration's fault and it's the Congress. But it also involves an economic system that we've had for a long time and a monetary system that we've had and a foreign policy that's coming to an end and we have to admit this. The Republicans were elected in 1994 to change direction of the country, because people sensed there was something wrong, we were going the wrong direction, but we didn't do anything. In the year 2000, we did, also. We were elected in the year 2000 to have a humble foreign policy and not police the world, and yet what are we doing now? We're bogged down in another war. We're bankrupting our country and we have an empire that we're trying to defend which costs us $1 trillion a year. And the standard of living is going down today. It's going down and the middle class is hurting because of the monetary policy. PAUL: When you destroy a currency, the middle class gets wiped out. Poor countries don't even have middle classes. We used to have one, and they're on the ropes right now. But it has to do with a fiscal policy, monetary policy, and foreign policy of way too much spending, but it took a lot of years for us to get here. The people in this country have been begging for a change in direction, and they haven't had it. It's time we gave it to them. COOPER: We've got a lot to get to on the economy. To begin with, let's go to Janet Hook of the L.A. Times. JANET HOOK, LOS ANGELES TIMES: Governor Romney, you've spent the last several days warning voters that John McCain as president would follow, quote, "a liberal, Democratic course." But, by most measures, doesn't he have a pretty mainstream conservative record? ROMNEY: I'm sure on many issues he does, and he's a good Republican. I wouldn't question those credentials at all. But there are a number of pieces of legislation where his views are out of the mainstream, at least in my view, of conservative Republican thought. So, for instance, he's opposed to drilling in ANWR, I believe. If I'm correct -- correct me, Senator. He voted twice against the Bush tax cuts. Only two Republicans did that. And then now McCain-Lieberman, which is a unilateral -- meaning U.S.-only imposed -- cap-and-trade program, which puts a burden, as much as 50 cents a gallon, on gasoline in this country. It basically says Americans are going to pay for the cost of global warming, not the Chinese and Indians and forth. So those views are outside the mainstream of Republican conservative thought. And I guess I'd also note that, if you get endorsed by the New York Times, you're probably not a conservative. ROMNEY: I'd say the same thing. MCCAIN: ... who know you well better than anybody. So I'll guarantee the Arizona Republic will be endorsing me, my friend. Let me just say I'm proud of my conservative record. It's one of reaching across the aisle to get things done for Americans, obviously, whether it be McCain-Lieberman that established the 9/11 commission, and then the legislation that implemented that, or whether it be working across the aisle in the Armed Services Committee to provide the men and women with what they need to defend this nation. And I'm proud of that record. And I heard Governor Romney describe his record. As I understand it, his record was that he raised taxes by $730 million. He called them "fees." I'm sure the people that had to pay it, whether they called them bananas, they still had to pay $730 million extra. His job creation was the third worst in the country, as far as people of Massachusetts with a $245 million debt because of the big government-mandated health care system. And while the rest of the country was losing 7 percent of the manufacturing jobs while he was governor, 14 percent of the manufacturing jobs left the state of Massachusetts. So I am proud of my record, and I am proud of reaching across the aisle and getting things done. That's what the American people want us to do. And the legislation and the activities I've done, particularly in this America's defense, particularly in the fact that I've been involved in every major national security challenge this nation has faced. And, by the way, I think it would be hard for people like Jack Kemp, and Tom Ridge, former head of the Department of Homeland Security, and Phil Gramm, and all of the long list of conservatives that support me, both governors, conservative governors, and, in fact, your former lieutenant governor, who is spending a lot of time on the campaign trail with us. But the point is that I'm proud of the people that have surrounded me and are supporting me. And whether they come from one part of the spectrum or the other, strong conservatives are ones who are supporting me, and I'm proud of their support. And I'll rely on people to judge me by the company that I keep. ROMNEY: OK, I got a little work to do here. Let me help you with the facts here, Senator. First of all, my lieutenant governor, Kerry Healey, endorsed me, and is supporting me, and is working all over the state for me. My predecessor in office, Governor Swift, Governor Swift is supporting you. ROMNEY: When you say that our state ranked number three in job creation, the study you're relying upon is a study that included her term in office. And during her term in office, 141,000 jobs were lost. During my term in office, we added jobs. And from the lowest point we added 60,000 new jobs. So that study, unfortunately, included the wrong data. With regards to fees, we raised fees $240 million. Not $730 million. Facts are stubborn things. We audited our fee increase, because, of course, we cared. Now, why did we raise fees $240 million? We had a $3 billion budget shortfall, we decided we were not going to raise taxes, and we found that some fees hadn't been raised in as many as 20 years. These were not broad-based fees for things like getting your driver's license or your license plate for your car, but instead something like the cost of a sign on the interstate and how much it was going to cost to publish a McDonald's or a Burger King sign on the interstate. We went from, like, $200 a sign to $2,000 a sign to raise money for our state in a way that was consistent with the what the market had done over the ensuing years. And let's see -- with regards to my health care plan, you know, a lot of people talk about health care. I'm the only one that got the job done. I got health insurance for all our citizens. We had 460,000 people without insurance. We got 300 of them -- 300,000 of them signed up for insurance now. I'm proud of what we accomplished. The bill that I submitted to the legislature didn't cost $1 more than what we were already spending. However, the legislature and now the new Democratic governor have added some bells and whistles, and they're willing to pay for them. I wouldn't do that if I were governor. I would veto the items they put in place there, but they're entitled to make changes if they want to. They're still running a balanced budget. I wouldn't have added the money they did. And by the way, no debt was left. I left a rainy day fund of over $2 billion. Facts are stubborn things. I'm proud of my record. COOPER: Governor Huckabee, Rush Limbaugh says if you or Senator McCain were nominated, would be the nominee, you would "destroy the Republican Party." HUCKABEE: You know, I wish Rush loved me as much as I love Rush. I think he's a great voice for conservatism. It doesn't mean he's infallible. And on this he's very wrong. And I want to make sure everybody understands, this isn't a two- man race. There's another guy who would like to stay down here on the far right of the stage. You want to talk conservative credentials? Let me get in on that. I created the first-ever broad-based tax cuts in the 160-year history of my state when I became governor with a 90 percent Democrat legislature. I also balanced the budget every one of the 10 and a half years. I'm the only person that's sitting here today that has consistently supported a human life amendment that's been part of our Republican platform since 1980, and also supports the marriage amendment to our Constitution, two conservative hallmarks. I believe in less government. I believe in lower taxes, not higher. I think it's important to streamline the federal government like we streamlined some services in Arkansas. Simple things like getting a driver's car tag, because it used to take a couple of days and about seven pieces of paper. We streamlined it so it could be done on the Internet in 4 and a half minutes. We consolidated state agencies. We cut 11 percent out of the budget. One of the things that Rush Limbaugh once praised me for was creating what I called the No -- Tax Me More Fund. And the way that worked was that we had a lot of people in our legislature that wanted us to raise taxes. And I said we don't need to raise taxes, we need to cut our spending. And so I created a fund called the Tax Me More Fund and said there's nothing in the law that says that you can't just pay more if you want to. And I had envelopes printed, and I said, anybody who wants to pay more taxes, just fill it up with whatever will make you feel better and send it right in. And it proved that a whole lot of people didn't really want to pay more taxes after all, because after about a year and a half, there was only about $1,200 in the account, $1,000 of which had been given by a liberal legislator. So if we're going to talk conservatism, I'd like to be in on the discussion. COOPER: Let's talk more about that. jJIM VANDEHEI, POLITICO: The first question from the readers, Governor Romney, is from Jonathan Rubin (ph) in Fairfax, Virginia. "As governor of Massachusetts, Senator McCain just pointed out you raised hundreds of millions of dollars in additional revenue through so-called fees and loophole closings. You passed a health care bill forcing individuals to buy insurance on the threat of a fine. How do you reconcile that policy with your claim to be the authentic conservative?" ROMNEY: Well, let's talk about each. I mentioned fees, and I think it's appropriate if the state is providing a service to someone that's not a requirement to have a car or a driver's license, but instead, let's say, we're going to be taking out an oil tank from your back yard because it's leaking into the ground and the state's going to provide that service. But to charge a fee sufficient to do so makes a lot of sense. And so the fees ought to be adjusted from time to time to compose the amount of what the cost is of providing that service. And if there hasn't been a fee raised in a couple of decades, you probably have some inflation in there you ought to adjust for. ROMNEY: But then, secondly, with regards to my health care plan, let me describe what I think is the ultimate conservative approach. In this country, you have today about 47 million people that don't have health insurance. We went out and tried to find out why they don't. We found out that about half of them could afford to buy insurance if it were reasonably priced. They could afford to buy it, but they weren't buying it. it? If we get sick, we can go to the hospital and get care for free." And we said: You know what? If somebody could afford insurance, they should either buy the insurance or pay their own way. They don't have to buy insurance if they don't want to, but pay their own way. But they shouldn't be allowed to just show up at the hospital and say, somebody else should pay for me. And so we said: No more free riders. It was like bringing "workfare" to welfare. We said: If you can afford insurance, then either have the insurance or get a health savings account. Pay your own way, but no more free ride. And that was what the mandate did. It said, you have got to come with either the insurance or a health savings account or the like. I think it's the conservative approach, to make sure that people who can afford care are getting it at their expense, not at the expense of the taxpayers and government. That I consider to be a step towards socialism. COOPER: Our next question is from Janet Hook of the L.A. Times. HOOK: This is for Senator McCain. Senator McCain, Governor Schwarzenegger has proposed that California be allowed to implement much tougher environmental regulations on emission requirements than apply to the rest of the country. This is an initiative that conservatives generally oppose, and the Bush administration rejected California's request. Do you side with the governor or with the Bush administration? Look, I'm a federalist. And I believe the states should decide to enormous degrees what happens within those states, including off their coasts. The people of California have decided they don't want oil drilling off their coasts. The people of Louisiana have decided that they do. I applaud the governor's efforts and that of other states in this region and other states across America to try to eliminate the greenhouse gas emissions that are causing climate change. Now, suppose that the governor and I are wrong, and there's no such thing as climate change. And we adopt these green technologies, of which America and the innovative skills we have and the entrepreneurship and the free market which is embodied by Senator Lieberman's and mine cap-and-trade proposal is enacted, and there's no such thing as climate change. Then all we've done is give our kids a cleaner world. But suppose we do nothing. Suppose we do nothing, and we don't eliminate this $400 billion dependence we have on foreign oil. Some of that money goes to terrorist organizations and also contributes to greenhouse gas emissions. Then what kind of a world have we given our children? The state of California and the state of Arizona, we Westerners care very much about our environment and we want to act. And it's no secret that I have disagreed with the Bush administration in not being more active in addressing the issue of climate change, whether it be through cap-and-trade, through tax incentives for R&D for green technologies and many other measures that I think need to be taken. We are feeling here in California pollution from China. It is a global issue, and we have to address it globally. And I would not agree to any global agreement without India and China being part of it. But I want to assure you that we have an obligation to try to stem these greenhouse gas emissions. And one of the ways is through the use of nuclear power. The French generate 80 percent of their electricity with nuclear power. I think that -- by the way, we now have a pro-American president in France, which shows if you live long enough, anything is possible in this world. But the point is, young Americans care. Californians care. People all over this country care. And we have to address this issue. We can do it. The greatness and strength of America is in our innovative capability and our ability to develop these green technologies. General Electric, the world's largest corporation, is committed to green technologies. We can do it. And to somehow believe that it will cost more money if we unleash the innovative and entrepreneurship of America I think does not have confidence in the ability of Americans to address this issue. COOPER: Governor Romney, what did you think of Senator McCain's response? And just to remind you, the original question is do you side with Governor Schwarzenegger or with the Bush administration on this issue? ROMNEY: Well, I side with states to be able to make their own regulations with regards to emissions within their own states. ROMNEY: But let's talk about our policies with regards to greenhouse gases and global warming. I think we all agree that America should become energy independent. The consequences of us continuing to buy over $1 billion of oil a day from people who oftentimes use this money against us is bad for our economy; it's bad for our foreign policy; and all that energy being used is probably bad for our environment. It's probably warming our environment. And we want that to stop. So a unilateral action to get ourselves off of foreign oil makes all the sense in the world. Nuclear power, biodiesel, biofuel, all the renewables, liquefied coal, where you sequester the carbon dioxide, those things make all the sense in the world. But when you put in place a new cap or a mandate, and particularly if you don't have any safety valve as to how much the cost of that cap might be, you would impose on the American people, if you do it unilaterally, without involving all the world, you'd impose on the American people a huge new effective tax: 20 percent on utilities, 50 cents a gallon for gasoline -- that's according to the energy information agency -- would be imposed on us. And here's what happens. I've lived in the business world. I've lived in the real economy for 25 years of my life. What happens if you do that? You put a big burden on energy in this country as the energy-intensive industries say, "We're going to move our new facilities from America to China, where they don't have those agreements." And you end up polluting and putting just as much CO-2 in the air because the big energy users go there. That's why these ideas make sense, but only on a global basis. They don't call it "America warming." They call it "global warming." That's why you've got to have a president that understands the real economy. COOPER: Just so I'm clear, you said you side with the states. That means you side with Governor Schwarzenegger on this one? ROMNEY: I side with states being able to make their own decisions, even if I don't always agree with the decisions they make. HUCKABEE: Well, I was a governor 10 1/2 years. I was chairman of the National Governors Association, which means that my fellow governors selected me to chair the organization of all 50 governors. Let me tell you why I believe that Governor Schwarzenegger ought to be able to carry out the plan, because, if he's right, every other state is going to copy him. And if he's wrong, every other state is going to recruit the jobs that he lost in California to their own states. The genius of our system has always been that, if you have states acting as laboratories of good government, rather than mess it up for all 50 states, you get the chance to find out, does it work? And if it does, we all copy it, and then we make a little change, and we claim it for our own. If it doesn't work, we do everything we can to make sure that the jobs that maybe he loses we get in our own state. It's the genius of our founding fathers when they had the idea of federalism. Thomas Jefferson was right, and Alexander Hamilton was wrong. That debate we thought was settled. But we've got a federal government that wants to give us unfunded mandates at the state level and doesn't want us to experiment with ideas in good government that might solve a lot of the problems that our country faces. COOPER: Congressman Paul, do you agree with Governor Schwarzenegger on this one? PAUL: Yes, I think California should do what they want, and we all recognize that. But one thing that hasn't been emphasized here that should be emphasized when we're dealing with the environment and gas house -- you know, greenhouse gases is property rights. We neglected during the industrial revolution property rights, and governments and big corporations got together and colluded. And that's what has to be reversed. You have to emphasize the property rights. But I would like to take one minute, since I didn't get a chance to answer this discussion on conservative versus liberal. COOPER: We're going to have -- I promise you we're going to have -- you're going to have another opportunity to do that. I promise you, coming up in like two minutes or two questions. I just want to go right now to Janet Hook for a question to Governor Huckabee. HOOK: Let's turn for a minute to the troubled economy we're trying to deal with. Governor Huckabee, President Bush and some of your opponents on the stage here believe that giving income tax rebates is the best way to stimulate the economy. You've disagreed and suggested that spending federal highway money to widen I-95 from Bangor to Miami would do more to help the nation's economy. Now, how is that idea different from the big- government projects that we usually associate with Democrats? HUCKABEE: Well, if we end up with the rebates, we're going to borrow the $150 billion from China. And when we turn it into rebates, most people are going to go out and buy some consumables like a pair of shoes that they probably don't even need, but they're going to buy them, and they're most likely an import from China. My point is, whose economy are we stimulating when we do that? The Heritage Foundation did a pretty interesting study on past rebates and found that it does not really stimulate the economy in the way that we hope that it will. My point was that if you really want an economic stimulus package, look at what infrastructure investment does. And we've got a crumbling infrastructure. I don't have to tell the people of California that their traffic is clogged. And the reason that we have a problem is that because we're not addressing it. Every billion dollars we spend on highway construction results in 47,500 jobs. But the fact is the average American is sitting in traffic 38 hours a year. HUCKABEE: That's a full work week, not on vacation, not spent with their kids, stuck in traffic, just sitting there behind the wheel, pointing fingers, usually one at a time, at other motorists and very upset with what's going on around them in this traffic. The point is we are burning a lot of fuel up in the air, polluting the environment. We're wasting time. Parents never get home to their kids' soccer games and recitals. And the real said thing is we have bridges falling down on people in the United States of America. Now, my point is, and it's not necessarily just I-95 from Bangor to Miami, I said that when I was in Florida. Today we might look at a western highway that would go down the California coast. But my point is that infrastructure in this country has been neglected, whether it's our airports, our bridges, our roads, and I don't think there's a governor in this state that wouldn't tell you that you'll create more jobs and you'll build it with American workers, American concrete and American steel. COOPER: Let's ask the other governor on the stage. Governor Romney, what do you think about that? ROMNEY: There's no question but that investment in infrastructure makes enormous sense for our country. It's good for business, it's good for the economy, and as the governor that watched the completion -- well, almost the completion of the big dig, I think that was -- I don't know how many governors watched that $15 billion project. COOPER: Was the big dig good, by the way? ROMNEY: As someone once said, at least badly, of course. So someone has remarked that it's the biggest car was in America and most expensive, too. It's solved a problem, but it cost way too much money to do. It was very badly managed. But that being said, an economic stimulus plan has to put money in the hands of consumers and businesses and homeowners now and the reason we're asking Congress to move within 30 days is we want to get that out there now so the economy doesn't tip down. Building a road project, you have to get designs, you have eminent domain, you get the engineers to approve it. It takes years and years and years to get a road project. So it's a wonderful idea, but it's not related to the short-term economic stimulus. PAUL: Well, you know, the governor says that you have to borrow for a handout of a check from the Chinese. Where are you going to get the money to build the highway? Same old thing. We have a foreign policy where we blow up bridges overseas and then we tax the people to go over and rebuild the bridges overseas and our bridges are falling down and our infrastructure is falling down. So, yes, this money should be spent back here at home. We have a $1 trillion foreign operation to operate our empire. That's where the money is. You can't keep borrowing from China. You can't keep printing the money. We have to cut some spending. That's what nobody here talks about. Where do you cut spending if you want to spend some money? We need lower taxes, less regulations, and we need to free up the market. We can't expect the government to do everything. We have to faith and confidence that the market works, but you can't do any of that unless you look at the monetary system. COOPER: Next question to Senator McCain from Jim Vandehei. VANDEHEI: We're staying on the economy here. As you well know, foreclosures last year were up 75 percent. A lot of people are losing homes. A lot of people who have adjustable rate mortgages are about to have them adjust up. Amanda Oro (ph) from Casey, Illinois wants to know if you have a plan to help people with bad credit get lower interest rates so they can keep those homes and avoid foreclosure. MCCAIN: Yes, and it's tough and it's tough here in California, it's tough in Arizona, it's tough particularly all over, but it's very tough particularly in the high growth states. And I think the efforts that have been made so far are laudable. We may have to go further, but the fact that the FHA and the other organizations of government under Secretary Paulson's direction, and I think he is doing a good job of sitting down and fixing at least a significant number of these problems. I think that we've got to return to the principal that you don't lend money that can't pay it back. I think that there's some greedy people on Wall Street that perhaps need to be punished. I think there's got to be a huge amount more of transparency as to how this whole thing came about so we can prevent it from happening again. When a town on Norway is somehow affected by the housing situation in the United States of America, we've gotten ourselves into a very interesting dilemma. If necessary, we're going to have to take additional actions and particularly in cleaning up a mortgage. A mortgage should be one page and there should be big letters at the bottom that says, "I understand this document." We ought to adjust the mortgages so people who were eligible for better terms, but were somehow convinced to accept the mortgages which were more onerous on them. We need to fix the rating systems, which clearly were erroneous in their ratings, which led people to believe that there were these institutions which were stable, which clearly were not. MCCAIN: So I think what we've done so far is good. I think we may have to take further steps if this subprime lending situation continues to be serious. And finally, could I just mention on the issue of rebates, fine, because part of this is psychological. Part of the problem we have, of course, in any recession is psychological. And I'm still optimistic that nothing is inevitable. I still rely on the innovation and the talent of the United States of America. But we've got to make the tax cuts permanent. We need to get rid of the Alternative Minimum Tax. We need to give people a depreciation in one year for their business and investment. We need to encourage research and development and tax credits that are associated with it. And we've got to stop spending. We've got to stop -- one place where Ron Paul and I are in total agreement, spending is out of control. And I'm tired of borrowing money from China. COOPER: Let's pick up on that with Janet Hook from the Los Angeles Times. HOOK: Senator McCain, you're talking about making the tax cuts permanent. And as Governor Romney pointed out before, you opposed the Bush tax cuts the first time around. Now, more recently you've been saying that the reason why you opposed the tax cuts at first was because they weren't offset by spending cuts. But back when you actually voted against the tax cuts in Congress, you said you opposed them because they favored the wealthy too much. So which is it? And if they were too skewed to the wealthy at first, are they still too skewed to the wealthy? MCCAIN: Actually, I think lower and middle income Americans need more help. Obviously, I think that's the case today. That's one reason why we're giving them rebates. I was part of the Reagan revolution. I was there with Jack Kemp and Phil Gramm and Warren Rudman and all these other fighters that wanted to change a terrible economic situation in America with 10 percent unemployment and 20 percent interest rates. I was proud to be a foot soldier, support those tax cuts, and they had spending restraints associated with it. I made it very clear when I ran in 2000 that I had a package of tax cuts which were very important and very impactful, but I also had restraints in spending. And I disagreed when spending got out of control. And I disagreed when we had tax cuts without spending restraint. And guess what? Spending got out of control. Republicans lost the 2006 election not over the war in Iraq, over spending. Our base became disenchanted. If we had done what I wanted to do, we would not only have had the spending restraint, but we'd be talking about additional tax cuts today. I'm proud of my record. I'm proud of my record as a foot soldier in the Reagan revolution, and now I'm prepared to lead in restraining spending. COOPER: Governor Romney, what do you think of Senator McCain's response? ROMNEY: I appreciate his response and appreciate the fact he was part of the Reagan revolution. I think that the Bush revolution and the downturn that we faced when he came in office suggested that we needed a tax cut. There's no question in my mind that Ronald Reagan would have said sign it and vote for it. And Senator McCain was one of two that did not. And again, the justification at the time was because it represents a tax cut for the rich. I believe in getting rates down. I think that builds our economy. When we talk about spending, however, I hope people in the country understand that most people in Washington, most politicians, generally want to talk about the $2 and $3 and $4 relative items. And they want to talk about the big one. Right now, federal spending is about 60 percent for entitlements -- Social security, Medicare and Medicaid. And that's growing like crazy. It will be 70 percent entitlements, plus interest, by the time of the next president's second term. And then the military is about 20 percent today. No one is talking about cutting the military, we ought to grow it. So people talk about the 20 percent and how we have to go after that 20 percent. There's not enough in the 20 percent to go after if we don't go after the entitlement problem. And you listen to all the folks running for president, no one wants to talk about it. But we have to talk about it. We have to put together a plan that says we're going to rein in the excessive growth in those areas, promising to meet the obligations we made to seniors. We're not going to change the deal on seniors, but we're going to have to change the deal for 20 and 30 and 40-year- olds, or we're going to bankrupt our country. COOPER: Let's talk about another issue which a lot of Americans watching tonight, immigration. And Jim VandeHei has a question. VANDEHEI: Obviously, we're here in California, where one-third of the population is Hispanic, Latino. Immigration has been a huge issue in this campaign from the beginning. Governor Huckabee, Brian Berry (ph) of Milwaukee, Wisconsin, wants to know, "In order to curb illegal immigration, do you support making changes in the law that would give citizenship only to children who are born to parents who are legally in this country at the time the child is born?" HUCKABEE: I think the Supreme Court has already ruled on that. The real issue is, that doesn't fix the problem. HUCKABEE: What we've got to do is to have a secure border fence, something I have proposed that we do within 18 months of taking office. If we don't have a secure fence and have just this open door that people can come in and out at will, we're never going to deal with this issue effectively and responsibly. And today, many Americans are angry not that people want to come here -- and I've repeatedly said and I'm going to say it again -- people in this country I think are grateful to God they're in a land that people are trying to break into and not one they're trying to break out of. So it's not that we're building a fence so we can keep our people in or keep people out, but that people who do come here would have to come legally. And touching the issue of those born here is not the challenge. It's two things. It's first making sure that that fence is built, I think within 18 months. And the second thing is that we have a process where the people who are here would have to go to the back of the line and start over. And it's not to be cruel. I want to make sure you understand. It's to make that everybody who is living in our boundaries has their head up and lives in the light, not the darkness, and doesn't run and hide every time they see a police car. We owe it not just to the people who have waited in line a long time. We owe it to the people who do want to live here and work here, but create a system that is legal, that makes sense, and that actually protects our borders but protects the dignity and worth of every person. VANDEHEI: Governor Romney, I interviewed you in New Hampshire a couple of weeks ago and we talked a little bit about illegal immigration. You've taken a very hard stance against illegal immigration. You said at the time that you felt that there's, for a lot of illegal immigrants who are here, under your plan, we could deport many of them within 90 days. How could that happen? How could we do it that quickly? ROMNEY: I think you may be confusing me with somebody else, but perhaps not. Let me tell you what my plan is. VANDEHEI: At the time -- I can just give you the quote if you like. You said that "many of those could be deported immediately," but that would allow slower deportation process for those with thought as quickly as 90 days. ROMNEY: My plan is this, which is for those that have come here illegally and are here illegally today, no amnesty. Now, how do people return home? Under the ideal setting, at least in my view, you say to those who have just come in recently, we're going to send you back home immediately, we're not going to let you stay here. You just go back home. For those that have been here, let's say, five years, and have kids in school, you allow kids to complete the school year, you allow people to make their arrangements, and allow them to return back home. But the key is this: These individuals are free to get in line with everyone else that wants to become a permanent resident or citizen. But no special pathway, no special deal that says because you're here illegally, you get to stay here for the rest of your life. And that's what I found to be so offensive with the Z visa, which was in the McCain-Kennedy bill. It said to all illegal aliens, unless you're a criminal, you're all allowed to stay here for $3,000 for the rest of your life. And that's a mistake. In my view, let us have a fixed period of time -- 90 days for some, depending on their circumstances, others longer, to the end of the school year -- even longer potentially. Do it in a humane and compassionate way, but say to those who have come here legally, you must return home, you must get in line with everybody else that wants to come here. There are millions throughout the world who want to come to this country legally. It's a wonderful privilege. But those that have come here illegally should not be given a better deal. I was just at the swearing in of some 700 citizens just a day or two ago in Tampa, Florida, and it was a thrilling thing to see these folks coming out, shaking their hands. People who come here legally are a great source of vitality and strength for our country. ROMNEY: But illegal immigration, that's got to end. COOPER: Janet Hook with the L.A. Times with a follow-up question. MCCAIN: No, I would not, because we know what the situation is today. The people want the border secured first. And so to say that that would come to the floor of the Senate -- it won't. We went through various amendments which prevented that ever -- that proposal. COOPER: Actually, we're going to be taking a short break. But before we do, one other question. This one goes to Governor Huckabee. On July 6, 1981, which is actually Nancy Reagan's birthday, Ronald Reagan wrote in his diary about Justice Sandra Day O'Connor. And the Reagan Library has graciously allowed us to actually have the original Reagan diary right here on the desk. I'm a little too nervous to actually even touch it, but that is the Ronald Reagan's original diary. And in it, he wrote by his hand, he said, "Called Judge O'Connor in Arizona and told her she was my nominee for Supreme Court. Already the flak is starting, and from my own supporters. Right-to-life people say she's pro-abortion. She declares abortion is personally repugnant to her. I think she'll make a good justice." That's Ronald Reagan's words from his own book. Governor Huckabee, was she the right choice? HUCKABEE: History will have to determine that, and I'm not going to come to the Reagan Library and say anything about Ronald Reagan's decisions. I'm not that stupid. If I was, I'd have no business being president. I think we need to talk about why the issue of right-to-life is important. For many of us, this is not a political issue; this is an issue of principle and conviction. And it goes to the heart of who we are as a country. If we value each other as human beings and believe that everybody has equal worth, and that that intrinsic value is not affected by net worth, or ancestry, or last name, or job description, or ability, or disability, then the issue of the sanctity of human life is far bigger than just being anti-abortion. It's about being pro-life and exercising that deep conviction held by our founding fathers that all of us are equal and no one is more equal than another, recognizing that once we ever decide that some people are more equal or less equal than others, then we start moving that line, and it may include us some day. And that's why for many of us -- and me included. Let me be very clear: I'm pro-life. I value every human being. And I would always make every decision always on the side of life every time I could, without equivocation. COOPER: Yes or no, Congressman Paul, was Sandra Day O'Connor the right choice? PAUL: I wouldn't have appointed her, because I would have looked for somebody that I would have seen as a much stricter constitutionalist. MCCAIN: I'm proud of Sandra Day O'Connor as a fellow Arizonan. And my heart goes out to her family in that situation that they have today. And I'm proud of her. The judges I would appoint are along the lines of Justices Roberts and Alito, who have a proven record of strict interpretation of the Constitution of the United States of America. I'm not going to second-guess President Reagan. ROMNEY: I would approve justices -- I would have favored justices like Roberts and Alito, Scalia and Thomas. I like justices that follow the Constitution, do not make law from the bench. I would have much rather had a justice of that nature. COOPER: We're going to pause for a quick commercial break. The debate continues when we return. COOPER: And welcome back to the Ronald Reagan Presidential Library in Simi Valley, California, our continuing debate. We have about a little bit more than 30 minutes left to go. A lot of questions to get to, so let's get started. This first one to Governor Romney. Peggy Noonan, President Bush's former -- excuse me, President Reagan's former speechwriter, recently wrote in The Wall Street Journal, and I quote, "George W. Bush destroyed the Republican Party, by which I mean he sundered it, broke its constituent pieces apart, and set them against each other. He did this on spending, the size of government, war, the ability to prosecute war, immigration, and other issues." Is the Republican Party better off than it was eight years ago? ROMNEY: I don't think we would say it's better off than it was eight years ago, to be truthful. I think the eight years that you've seen -- and I don't blame that on President Bush. I blame that on Washington. I look at what he tried to do. He took on some tough issues. He took on Social Security, for instance, put forward a plan to reform Social Security, and the other side of the aisle said, "What, me, worry? "We've got no problem." And they were unwilling to become engaged and take that on. He was hit by something which completely took his agenda off course, and that was the Iraq conflict and the attack of 9/11, and Afghanistan. All these things came together. And that's a very important legacy that he left for the Republican Party in a positive way. And I watched with horror as I watched the Democratic candidates for president all having a competition. get out?" It was very clear in the answer of all three candidates getting out was more important than winning, and they're wrong. And I'm pleased that this president has stood for strength. There are places, however, that I think you look and say we have weakened ourselves. One is with regards to spending. We have overspent in Washington. Even discretionary funds have gone up well above inflation. I count the inflation less 1 percent, but that was a problem. We did not deal with entitlements. He tried. He did not get the support he needed. He did fight for better schools. I think No Child Left Behind takes the ball forward, not backward. ROMNEY: So we made some progress. But we're in the house that Reagan built. It's important that we, as Republicans, stay in the house that Reagan built. If we want to take the White House again, social, economic and foreign policy conservatives have to come together. COOPER: Let's talk about foreign policy. You're all going to be able to weigh in on the question of Iraq. Let's go right now to Janet for the first question. HOOK: Yes. I'd like to start with Governor Romney. Obviously, Iraq is still a major issue in this campaign, and over the last few days there's been a real back-and-forth going on here. Senator McCain has said over and over again that you supported a timetable for a phased withdrawal from Iraq. ROMNEY: Absolutely, unequivocal -- if I can get that word out -- unequivocably, absolutely no. I have never, ever supported a specific timetable for exit from Iraq. ROMNEY: And it's offensive to me that someone would suggest that I have. And I have noted that everyone from Time magazine to Bill Bennett over there to actually CNN's own analysts, he said it was a lie and it's absolutely wrong. I do not support that, never have. We've had -- we've -- and Senator McCain pointed to an interview I had back in April with ABC, when I said that our president and their prime minister should have timetables and milestones. We have timetables and milestones for progress that we're making together. But I never suggested a date specific to withdraw and, were to give you a date specific for withdrawal, would you, Senator, veto it?" I said I'd veto it. I'm opposed to setting a specific date for withdrawal. By the way, we've had, since that time, 10-12 debates. Senator McCain never raised that question in any of those debates. If he ever wondered what my position was, he could have raised it. I instead have pointed out time and time again, and let me make it absolutely clear again tonight, I will not pull our troops out until we have brought success in Iraq, and that means, for me, that we do not have safe havens for al Qaeda or Hezbollah or anyone else, that our troops have secured the population from that kind of threat, that they will not have safe havens from which they could launch attacks against us. ROMNEY: ... 15 debates. I do not propose nor have I ever proposed a public or secret date for withdrawal. It's just simply wrong. And by the way, raising it a few days before the Florida primary, when there was very little time for me to correct the record, when the date of withdrawal," sort of falls in the kind of dirty tricks that I think Ronald Reagan would have found to be reprehensible. COOPER: Senator McCain, tough words. MCCAIN: Well, of course, he said he wanted a timetable. Before that, we have to understand that we lost the 2006 election and the Democrats thought that they had a mandate. They thought they had a mandate to get us out of Iraq. And I was prepared to sacrifice whatever was necessary in order to stand up for what I believed in. Now, in December of 2006, after the election, Governor Romney was won't weigh in. I'm a governor." At the time, he didn't want to weigh in because he was a governor, I was out there on the front lines with my friends saying, "We not only can't withdraw, but we've got to have additional troops over there in order for us to have a chance to succeed." Then in April, April was a very interesting year (sic) in 2007. That's when Harry Reid said the war is lost and we've got to get out. And the buzzword was "timetables, timetables." Governor, the right answer to that question was "no," not what you said, and that was we don't want to have them lay in the weeds until we leave and Maliki and the president should enter into some kind of agreement for, quote, "timetables." ROMNEY: Why don't you use the whole quote, Senator? ROMNEY: ... not using the actual quote? That's not what I said. ROMNEY: Is it not fair -- is it not fair to have the person who's being accused of having a position he doesn't have be the expert on what his position is? How is it that you're the expert on my position, when my position has been very clear? ROMNEY: That's a separate point. MCCAIN: ... back when we were having the fight over it. MCCAIN: ... that I have fought for this surge. I have said we need to have this succeed. I know the situation in Iraq and I am proud to have supported this president and supported the fact that we are succeeding in Iraq today. MCCAIN: ... quotes that I am giving you that are direct quotes. COOPER: ... "that they speak about, but those shouldn't be for public pronouncement. You don't want the enemy to understand how long they have to wait in the weeds until you're going to be gone." COOPER: He does not say he is supporting a withdrawal. MCCAIN: ... wait until the enemy lays in the weeds until we leave. That means that we were leaving. COOPER: It's open to interpretation. MCCAIN: If we weren't leaving, how could the enemy lay in the weeds? ROMNEY: Senator, if you have question on this, if you have a question on this, you can just ask it. COOPER: ... so let me just allow you to respond to the issue of the going to be gone, laying in the weeds question. MCCAIN: Timetables was the buzzword for those that wanted to get out. COOPER: And you're saying, point blank, you did not want to get out then. What did you mean by that statement? ROMNEY: That we have a series of timetables and milestones for working on the progress that they're making, the progress we're making, the rule of law, what their soldiers are doing, what our soldiers are doing. ROMNEY: How many troops they're able to recruit, how well the following question, "do you have a specific time, would you support Congress if they gave you a specific time?" I said "absolutely not." ROMNEY: By the way, this has been around. If this was a question, it could have been raised in April or May. MCCAIN: It was raised many times. I raised it many times, as to whether you have the experience and the judgment to lead this country in the war against radical Islamic extremism. I've raised that many times. MCCAIN: And I will continue to raise it. COOPER: ... a chance to respond to the other accusation. COOPER: All right. Let's just focus on this, the second one, which is the issue that Senator McCain raised, which was actually back in the surge, when you were a governor, and you did say you would not take a position. This was in January -- excuse me -- December of 2006. Two months later, you announced you were running for president. Why two months before you were running for president were you not willing to take a position on supporting or not supporting a surge? ROMNEY: Look, as governor of the state, there are a lot of issues of a federal nature that I didn't take a position on. I was running a state. My responsibility was for running a state. When I became a governor, I took a whole series of positions on national issues. That's normal and natural. With regard to the surge, the briefing that I received -- I received an early briefing from Fred Kagan on the size of our military. After I received that, I said I support increasing our military by at least 100,000. And then just prior to the president's announcement of the surge, I spoke again with Fred Kagan, and he laid out the philosophy of the surge, his vision for it. As you know, many consider him one of the authors of the surge idea. And when he gave me that report, I met with my staff and announced that day that I supported a surge. The president announced later that day the entire program. So I supported it as a candidate for president, No. 1. No. 2, with regards to this idea that I favor a specific date for withdrawal -- I do not. We've had, I believe since that interview that the senator quotes, we've had 10 or 12 debates. He's never raised that issue with me. He's never said, "are you for a date specific?" had, I said I will not leave Iraq until we have secured Iraq, make sure it will never become a safe haven. And what's interesting here is it's an attempt to do the Washington-style old politics, which is lay a charge out there, regardless of whether it's true or not, don't check it, don't talk to the other candidate, just throw it out there, get it in the media and the stream. There's not a single media source that I've seen that hasn't said it wasn't reprehensible. Even the New York Times said it was wrong. The Washington Post -- they endorsed you -- The Washington Post gave you three Pinocchios for it. It's simply -- it's simply wrong, and the senator knows it. COOPER: I want to give, Senator, final comment on this subject, and then we have a lot more about Iraq that we are going to talk to the other candidates about as well. MCCAIN: ... in the debate. It wasn't -- it wasn't -- and when he said what he said in December, it was after the election. President Bush fired Rumsfeld, and we announced that we are going to have a new strategy. That was the critical time. Timetables was the buzzwords. Timetables were the ones. And as far as Washington politics is concerned, I think my friend Governor Huckabee, sir, will attest the millions of dollars of attack ads and negative ads you leveled against him in Iowa, the millions of dollars of attack ads you have attacked against me in New Hampshire, and have ever since. ... your negative ads, my friend, have set the tone, unfortunately, in this campaign. I say to you again: The debate after the election of 2006 was whether we were going to have timetables for withdrawal or not. Timetables were the buzzword. That was the Iraq Study Group. That was what the Democrats said we wanted to do. Your answer should have been no. COOPER: I want to go to Jim VandeHei with a question for, I believe, Congressman Paul. VANDEHEI: Congressman Paul, this comes from Jay Majumdar (ph) from Roswell, Georgia. And he wants to know if you agree with Senator McCain's statement that the United States might need to have U.S. troops in Iraq for as long as even 100 years? They agreed with going in; they agreed for staying, agreed for staying how many years? And these are technicalities. We should be debating foreign policy, whether we should have interventionism or non-interventionism, whether we should be defending this country or whether we should be the policemen of the world, whether we should be running our empire or not, and how are going to have guns and butter? You know, the '70s were horrible because we paid for the guns and butters of the '60s. Now we're doing the same thing. And nobody even seems to care. The dollar is crashing, and you're talking about these technicalities about who said what when? I mean, in 1952, we Republicans were elected to stop the war in Korea. In 1968, we were elected to stop the war in Vietnam. And, tragically, we didn't stop it very fast: 30,000 more men died. So when I talk about these long-term stays, I think, "How many men are you willing to let die for this, for something that has nothing to do with our national security?" COOPER: Governor Huckabee, the idea of a 100-year involvement of the U.S. -- the idea of a 100-year involvement by the U.S. in Iraq? HUCKABEE: Well, first of all, I didn't come here to umpire a ballgame between these two. I came here to get a chance to swing at a few myself. So I'd appreciate maybe a question that we could talk about that would involve some of us down here at the end who've been left out of the discussion for the last few minutes. HUCKABEE: Let's hope it doesn't take that long, but the one thing I do agree with is that we need to leave with victory, and we need to leave with honor. And the reason we need to is because, if we leave a bigger mess in Iraq than is there now, it is not just going to affect Iraq. It's going to affect the rest of the Middle East. It will erupt in a completely destabilized environment into which that vacuum is exactly the kind of situation that al Qaeda can build a strong base. Iran would love to be able to see a destabilized Iraq, because they've been fighting in Iraq and for Iraq for a long time. If we leave it vulnerable, all we've done is create a situation that the rest of the world is going to have to be back into sooner or later for all of our interests. And with all due respect, Congressman Paul -- and I do think you're right, we don't want to be there for 100 years -- but however long it takes to get out of there with victory and with honor, we owe it to those who have gone to make sure that they did not go in vain. And we need to make sure that future sons and daughters of America don't have to go back and do it over. COOPER: Also, for accuracy's sake, I just want to point out Senator McCain was talking about 100-year involvement in the same way as the U.S. being involved in South Korea, not at the current situation that it is now. Janet Hook, you have another question on foreign policy for Governor Huckabee. HOOK: I have another one for you, Governor Huckabee. MCCAIN: You're not going to let me address the quote that you attributed to me? COOPER: All right, fine, if you could briefly. MCCAIN: Thank you. It's a false argument. It's a false argument. We are going to be there for some period of time, but it's American casualties, not American presence. We've got troops right next door in Kuwait. We'll probably have them there for a long time. We have troops in Bosnia. We've had troops in South Korea for some 50 years. By the way, President Eisenhower didn't bail us out of Korea. But the point is that we need to protect America's national security interest. It's not a matter of presence. It's a matter of casualties. We are succeeding. We are succeeding. And I unequivocally put my career and my political fortunes on the line and unequivocally said we're going to support this surge. We're not going to talk about timetables or anything else; we're going to talk about winning and what's necessary to win. And I'm the only one that said that Rumsfeld had to go and the Petraeus strategy is the one that can succeed. That's because I have the experience, the knowledge, and the judgment. And I believe that Americans will come home with honor. And the fact is -- and the fact is that it's not American presence, because America, as the world's superpower, is going to have to be a lot of places in the world. It's how they come home. And as president, I will follow in this tradition of sticking to my principles no matter what and bring our troops home with honor. COOPER: Janet Hook from the Los Angeles Times. HOOK: OK. Governor Huckabee, we're going to shower you with questions now, OK? HUCKABEE: Well, good. I'd like to be here tonight. Thank you. HOOK: President Bush once said he looked into the eyes of Russian President Vladimir Putin and found him to be, "very straightforward and trustworthy," and that he "got a sense of his soul." Senator McCain says he looks into Putin's eyes and he sees three letters -- KGB. When you look at President Putin, what do you see? HUCKABEE: Well, I don't know that I can read people's souls that well, and I've spent a lot of my life looking at people and talking to them. But I look at people's actions, because you can look into their eyes and their eyes can lie, but their actions don't. And when people take actions that cause us to give concern to human rights violations, to oppression -- and I don't care what their eyes are saying -- their actions are speaking a whole lot louder than their eyes ever will. And we need to be looking at what people are doing, not just what they're saying, and recognizing that our foreign policy needs to reflect an extraordinary strength. We need to make sure that the rest of the world knows that we're going to have a military that they're not wanting to engage for any purpose. And I do believe that President Reagan was right, you have peace through strength, not vulnerability. We've got to an Army that is well-staffed, well-trained, well- financed, and that is prepared for anything. And hopefully because it is so well-prepared, it never has to be used. We can't continue to have one that is stretched and pulled, and particularly -- and I'm very sensitive to this having been a governor and watched some of our National Guard troops spend three out of five years in active duty -- if we're going to engage them, we have to make sure we've got enough troop strength of regular Army and our Air Force and Navy that we don't have to have extended deployments out of our guard and reserve units. COOPER: Governor Huckabee -- excuse me -- Governor Romney, your thoughts on Vladimir Putin? ROMNEY: Well, Putin is heading down the same road that we've seen authoritarian leaders in Russia and the former Soviet Union head down before, and it's very troubling. You see a leader who wants to reestablish Russia as one of the great powers of the world, potentially a superpower, potentially the superpower. And he has -- the evidence of that, of course, is his elimination of the free press, his terrorizing and imprisoning political prisoners, and unexplained murders that are occurring. It's a -- it's another repressive regime, which he is overseeing. And the question is what do you in a circumstance like that and what it portends for the future of the world. What we have today in the world is four major, if you will, strategies at play. One, they're the nations with the energy, like Russia. They're trying to use energy as a way to take over the world. Then there's China, which is saying we're going to use communism, plus sort of a Wild West form of a free enterprise. We're going to give nuclear weapons -- or nuclear technology to the Iranians, we're going to buy oil from the Sudanese. You've got China. Then you've got al Qaeda, which says we want to bring everybody down. And then finally there's us, the only major power in the world that says we believe in free enterprise and freedom for the individual. And this great battle is going on right now, and it's essential for us to strengthen other friends like ourselves, and to confront one by one these other strategies and help turn them towards modernity so that the world our kids inherent does not have to know war. Will there be war? Of course there will always be terrible events in the world. But let's do everything in our power to keep war from occurring. Move these voices of moderation and having such strength in our own military that people never question our ability to respond. COOPER: Some questions about leadership now -- Janet Hook. HOOK: I want to start with Senator McCain. There's been a lot of discussion lately about the importance of leadership and management experience. What makes you more qualified than Mitt Romney, a successful CEO and businessman, to manage our economy? MCCAIN: Because I know how to lead. I know how to lead. I led the largest squadron in the United States Navy. And I did it out of patriotism, not for profit. And I can hire lots of managers, but leadership is a quality that people look for. And I have the vision and the knowledge and the background to take on the transcendent issue of the 21st century, which is radical Islamic extremism. I've been involved in every single major national security crisis since -- in the last 20 years. I'm proud to have played a role in those, and I'm proud to have played a role in making sure that we didn't raise the white flag and surrender in Iraq, as the Democrats wanted us to do and we would have done if we had set timetables for a withdrawal. So, the fact is -- so the fact is that I have the qualifications and the knowledge and the background and the judgment. I don't need any on-the-job training. MCCAIN: I had the great honor of serving this country in uniform for 22 years. I had the great honor of being inspired while I was in the prison camps of North Vietnam by the news of a governor and his wife who cared very much about those of us who were in captivity. And when I came home, I was inspired by him, and I voted for him, and I supported him, and I was proud to be a leader in the Reagan revolution -- I mean, a foot soldier in the Reagan revolution, as we fought these wars together with unshakable courage and principle. And I'm prepared to follow in his tradition and in his footsteps. COOPER: Governor Romney, I've got to let you in on this. Is Senator McCain a better leader in terms of the economy? ROMNEY: No. He's a fine man and a man I respect, and I particularly respect his service in the military and his integrity and courage for our nation. I do believe that as people over the centuries have considered who ought to lead our country, they don't look to senators. They look to governors. And they look to governors because they have the experience of being executive leaders. They're actually leading something. They're making something happening. They're running something. They're leading an organization. Senators and congressmen are fine people, but they're legislators. They sit in committees. They're committee chairs. And they call that leadership. In my view, the key leadership of my life was 25 years in the private sector, helping build business, turn a business around, start a business successfully, then going off to the Olympics, helping turn the Olympics around. You don't do that as a manager; you do that as a leader. We shouldn't demean the people who are starting up small businesses, or middle-sized businesses, or people who run volunteer organizations. They're leaders. You can't go out and hire managers to run these things. These are people who are leading our economy. They help lift our country. I think in order to have somebody fix our economy and strengthen it -- and it's our economy that's the root of our strength to provide for our military, for our families -- we have to have a strong economy -- you've got to have somebody who's actually done some work in the private economy, who understands how it works. I went on to become a governor. I went on to become a governor. And as a governor, you're also a leader. You're the commander-in- chief of your National Guard. You're in charge of the state police. You're in charge, in my case, of tens of thousands of employees. You work together with the legislature to get the job done. I'm proud of my experience as a leader, and I will use that leadership skill, which has honed my sense of judgment, temperament, wisdom, decision making capacity, and ability to deliberate on tough issues to make sure you get them right, to make sure that we have the right kind of leadership in the White House. COOPER: Jim VandeHei has a follow-up question. We'll get to all of you, I promise. VANDEHEI: Let's turn that around. Even today, Rudy Giuliani endorsed John McCain and said that there would be no better commander- in-chief. What makes you more qualified than John McCain to run the military as commander-in-chief? ROMNEY: You know, I'm sure that are those who'd say, you know, to be the commander-in-chief you have to serve in the military. And one of the two great regrets I have in life is I didn't serve in the military. I'd love to have. But I don't believe that you have to have served in the military to be a great commander-in-chief or to be a great foreign policy expert. I think you're going to see in our foreign policy and in the military, we're going to face challenges not like the challenges of old, where I'd liken it to playing checkers with the red side and the black side. It's more like three-dimensional chess. And you're going to have to have people of unusual capacity in bringing in the perspectives of the entire world and thinking about how you move your pieces and how you make changes that can strengthen America's position. You see, my objective is to keep America the strongest nation on Earth, economically, militarily, and, if you will, from the spirit of our people. I believe I can do that by virtue of a lifetime of experience leading, making decisions. But, you know, some of our great leaders -- look at Abraham Lincoln, was not a military expert, but turned out to be one of the best in the history of this country. COOPER: I'm going to ask you all for follow-ups on this, but, Senator McCain, I just want to give you an opportunity to follow up on that. Is Governor Romney ready to be a military commander? MCCAIN: Oh, I'm sure that, as I say, he's a fine man. And I think he managed companies, and he bought, and he sold, and sometimes people lost their jobs. That's the nature of that business. But the fact is -- but the fact is we're at a time in our history -- we're in a time in our history where you can't afford any on-the- job training. And I believe that my experience and background qualifies me to lead. And that's why I've gotten the support of four former secretaries of state, two of them in the Reagan administration. That's why I've gotten the support of General Norman Schwarzkopf. That's why I've gotten the support of over 100 retired Army generals and admirals. Literally every national security expert from the Reagan and other administrations are supporting my candidacy, including the former head of the Department of Homeland Security, my friend, Governor Tom Ridge, who believe that I have the qualities necessary to lead. MCCAIN: I hope that some people judge me by those that are supporting me. COOPER: Congressman Paul, what makes you capable of being a leader both on the economy and the military? PAUL: OK. The Constitution is very clear that the president is commander in chief of the military, but the president is not the commander in chief of the economy or of the people. And when we get reflection of conventional wisdom, but of a lot of lack of understanding of how the economy works. The president is not supposed to manage and run the economy. The people are supposed to do this. The government is supposed to give them sound money, low taxes, less regulation. The people are supposed to run it. COOPER: What role do you think the federal government should have -- I mean, does the federal government in your opinion have a role in stimulating the economy? PAUL: Yes, by lower taxes and less regulation. They could do a whole lot by having sound money, where we don't print the money out of thin air. That causes the business cycle. That causes your bubbles. We're always dealing with the symptoms of the disease and never saying, "how did this come about?" You know, it comes about because we have a Federal Reserve that creates money and prints it out of thin air. There is a lot of malinvestment. That's the most important thing to understand about the inflation of the monetary system, is the malinvestment. Then, later on, people suffer. You wipe out the middle class. But the evil of it all is the vehicle for financing wars that we shouldn't be in and a welfare state that we shouldn't be doing. So, yes, we have a role to play, but it's a negative role. We want the people to be free. We don't want to manage the people and tell them how to live. And we need a commander in chief. But the most important thing as a commander in chief is not moving troops around, as much as it is having a wise foreign policy that doesn't get us involved in so many things that we get trapped in and we linger year after year. We've been doing this for so long. And I like President Bush's argument that we have a humble foreign policy when he ran in 2000, and that we not be the policemen of the world. COOPER: Governor Huckabee, what makes you qualified on economic issues, on the military? HUCKABEE: Well, first of all, let me say -- a while ago, you said you were going to shower me with questions, and I think then you turned the spigot off, so I want to make sure I get a little time in here to get some time. I want to just say that I agree with something that Governor Romney said. He talked about that governors are well prepared to be presidents. And I think he's right about that. And if that's the case, then I appreciate his endorsement, because I've been a governor and led a state longer than anybody running for president, Democrat or Republican. I've actually managed a government for 10 and a half years. There's something a lot of people don't think about. When you're a governor, you actually manage a microcosm of the federal government. Every agency that you have at the federal level, you have at the state level. You are familiar with the whole game board. You understand what those agencies do, because you interrelate with them as a governor every single day. But you know what the biggest frustration is? Washington doesn't understand how states operate, but states understand how Washington operates, and that's the fundamental difference. We understand, because unfunded mandates come stomping down on top of us, wrecking our state budgets, creating a complete imbalance of power, ignoring the 10th Amendment. And that's one reason that a lot of us are ready to say it's time for a new type of leadership that respects the 10th Amendment, that respects the fact that governors are out there fighting to try to build a decent education system, create jobs, make sure that we can give families a chance to have a decent way of living. And that we get governments off the backs of mothers and fathers who ought to be raising kids without a whole lot of government interference. Those are the reasons that I think when a governor gets to the White House, he does understand that leadership is about looking at all of those issues and realizing that there is no such thing as an isolated issue. Education, health care, economic development -- they're all tied together, Anderson. And this is something that I don't hear coming often from people, who, with all due respect, in the legislative branch, have the luxury of picking out particular issues that they can specialize in. Governors don't get to specialize. They have to be able to handle on any given day several dozen different issues and see how they integrate together for a strong economy, a strong sense of security. And that's how it works. COOPER: You've said repeatedly you want a presidential candidate -- or you think voters want a presidential candidate, quote, "who looks more like the guy they work with than the guy who laid them off." What exactly do you mean by that? I mean, what about leadership, ability, experience? HUCKABEE: That's exactly -- real leadership recognizes what your decisions do to people at the bottom. That's what I mean by it, Anderson. You can't have a president who sees a whole bunch of America as invisible. If you make a decision at the top and you don't understand how it affects the person all the way at the bottom, then you're not ready to lead. Leadership is about seeing the whole field. HUCKABEE: And that's what I'm talking about. And that's why -- listen, our Republican Party is going to be in trouble if we creating policies and acting like we don't understand what those folks are feeling out there waiting the tables, handling bags, driving the trucks, and moving the freight around. COOPER: We only have about four minutes left. And this is a time restriction that all the campaigns put on us. We would be happy to have this debate go on all night long, but I know everyone has a lot ahead and a lot on their plates. So this is a question that will go to each of you. Each of you has about a minute to answer. We'll start with Governor Romney. Would, and if so, why -- why would Ronald Reagan endorse you? Would Ronald Reagan endorse you? And if so, why? ROMNEY: Absolutely. Ronald Reagan would look at the issues that are being debated right here and say, one, we're going to win in Iraq, and I'm not going to walk out of Iraq until we win in Iraq. Ronald Reagan would say lower taxes. Ronald Reagan would say lower spending. Ronald Reagan would -- is pro-life. He would also say I want to have an amendment to protect marriage. Ronald Reagan would say, as I do, that Washington is broken. And like Ronald Reagan, I'd go to Washington as an outsider -- not owing favors, not lobbyists on every elbow. I would be able to be the independent outsider that Ronald Reagan was, and he brought change to Washington. Ronald Reagan would say, yes, let's drill in ANWR. Ronald Reagan would say, no way are we going to have amnesty again. Ronald Reagan saw it, it didn't work. Let's not do it again. Ronald Reagan would say no to a 50-cent-per-gallon charge on Americans for energy that the rest of the world doesn't have to pay. Ronald Reagan would have said absolutely no way to McCain- Feingold. I would be with Ronald Reagan. And this party, it has a choice, what the heart and soul of this party is going to be, and it's going to have to be in the house that Ronald Reagan built. COOPER: Your campaigns wanted this tight, so let's keep it tight. Senator McCain, would Ronald Reagan endorse you? Ronald Reagan -- Ronald Reagan came with an unshakable set of principles, and there were many times, like when he had to deploy the (INAUDIBLE) cruise missile to Europe and there were hundreds of thousands of demonstrators against it, he stood with it. Ronald Reagan had a deal in Reykjavik that everybody wanted him to take, but he stuck with his principles. I think he knows that I stick with my principles. I put my political career on the line because I knew what would happen if we failed in Iraq. I hope that the experience I had serving as a foot soldier in his revolution would make him proud for me to continue that legacy of sticking to principle and doing what you believe in, no matter what. PAUL: I supported Ronald Reagan in 1976, and there were only four members of Congress that did. And also in 1980. Ronald Reagan came and campaigned for me in 1978. I'm not sure exactly what he would do right now, but I do know that he was very sympathetic to the gold standard, and he told me personally that no great nation that went off the gold standard ever remained great. And he was very, very serious about that. So he had a sound understanding about monetary policy. And for that reason, I would say look to Ronald Reagan's ideas on money because he, too, was concerned about runaway inflation and what it does to a country when you ruin the currency. And that's what's happening today. The dollar is going down and our country is going to be on the ropes if we don't reverse that trend. HUCKABEE: I think it would be incredibly presumptuous and even arrogant for me to try to suggest what Ronald Reagan would do, that he would endorse any of us against the others. Let me just say this, I'm not going to pretend he would endorse me. I wish he would. I would love that, but I endorse him, and I'm going to tell you why. It wasn't just his specific policies, but Ronald Reagan was something more than just a policy wonk. He was a man who loved this country, and he inspired this country to believe in itself again. And if we can recapture that, that's when we recapture the Reagan spirit. It's that spirit that has a can-do attitude about America's futures and that makes us love our country whether we're Democrats or Republicans. And that's what I believe Ronald Reagan did -- he brought this country back together and made us believe in ourselves. COOPER: Gentleman, good luck to you all. Thank you very much for attending this debate tonight. And that concludes this debate.